This year, Dad and I decided that we would sit out of the moose lotto. It made sense. 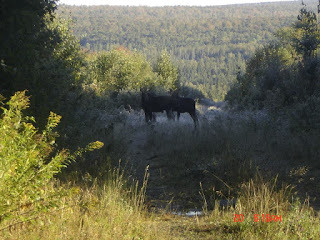 In 2010, when Dad was picked, we spent a solid 8 hours a day riding the roads in his truck looking for moose, walking around in the woods calling for moose and seeing a lot of hunters and only 1 dead cow. Since we know the time commitment that we are looking at if we get picked, and with me nursing a 4 month old come October, we decided to not apply for a permit. But, with the new Maine Moose Lotto revamped from what it was in 2011, Dad and I could still get points for applying and ensure our names were not entered to be drawn for permits. For each year that you apply and you do not get a permit, you gain a point. I am up to 5 points right now. The catch is that even if you don't want a permit, you still need to pay the fee of $15. So, for Dad and I, we paid $30 and will just gain a point each. "I don't see the point in wasting the money this year, sadly. With some households getting more than one permit and most people getting none for years on end...its not something I can afford to throw money away on." "I lost my points once when I didn't put my application in, so now I'm down to only seven. I don't think anyone should lose points for not applying every year. **We pay for those points. ** I don't think we should get points for years we don't apply, but taking away something we paid for isn't right." When I asked the Commissioner about this, he said "The legislature debated the payment in the exact situation that you describe and decided that the fee should remain if the applicant was remaining in the point process. It is, therefore, in statute." It is an interesting dilemma; while I am not a fan of paying the fee to really get nothing out of it, I understand where the money goes and the need to keep the funds coming. At the same time, losing points for not putting in an application is a catch 22 that forces people to pay the fee even if they don't want the permit but want to maintain the points. With this new system, the probability of people getting a permit after waiting for years has gone up considerably. If you get drawn, you must wait 3 years before being eligible to get a permit again, which opens up more slots for new hunters. A Maine Moose permit is something that is a coveted thing in the hunting world and when I visited the tagging station last fall, I met a few hunters who had shot their first moose, on their first permit drawing after 32 years. So, my question to you: would you pay the $15 for a point, knowing that you would not get a permit? Do you think it is worth it? I haven't had much experience with hunting lottos, but because of that I've always been interested in the politics and dynamics surrounding them. The idea of paying for a point that you know you don't want is kinda hard to wrap your head around. However, I think perspective is important. Could you forgo the $15 (a week's worth of Starbucks coffee or some other trivial thing) to help ensure that when you're ready you'll have a tag and memories to last a lifetime? I could, without a doubt. Never hunted Moose before but, it is one of those items I would put on my bucket list. Absolutely pay for a point. If you can't hunt pay for a point so when the year comes that you can hunt your odds at getting drawn are that much higher. A Maine Moose Hunt is a true hunt of a lifetime. I was fortunate enough last year to guide my 11th successful moose hunt in Maine before I turned 30. $15 is extremely cheap, literally peanuts, compared to some big game lotteries like tags that are drawn out west. Many of those lotteries are hundreds and you must pay upfront before the lottery is drawn and if your are not drawn than your tag fees are refunded minus lottery fees. If you are a serious moose hunter than you will not have any problems remembering to apply each year so you don't lose your points. If you lose them then the only person you can blame is yourself, no exceptions. You have a few months to apply, so I can imagine someone not remembering to apply then blaming the state when their laziness was actually to blame. That is why I love the email notifications! We did buy the points. I usually go online and buy my license, Dad's and my father-in-law's and then I put Dad and I in for doe permits and our moose permit. It's very convenient and easy.